Sometimes there needs to be meat. And sometimes grilling just isn’t going to happen. It took me more than a few tries to perfect the art of indoor steak, but my struggle was well worth it. Grills are wonderful in their season, but what a pan-seared steak lacks in flame-kissed smokiness, it makes up for in pristine caramelization. 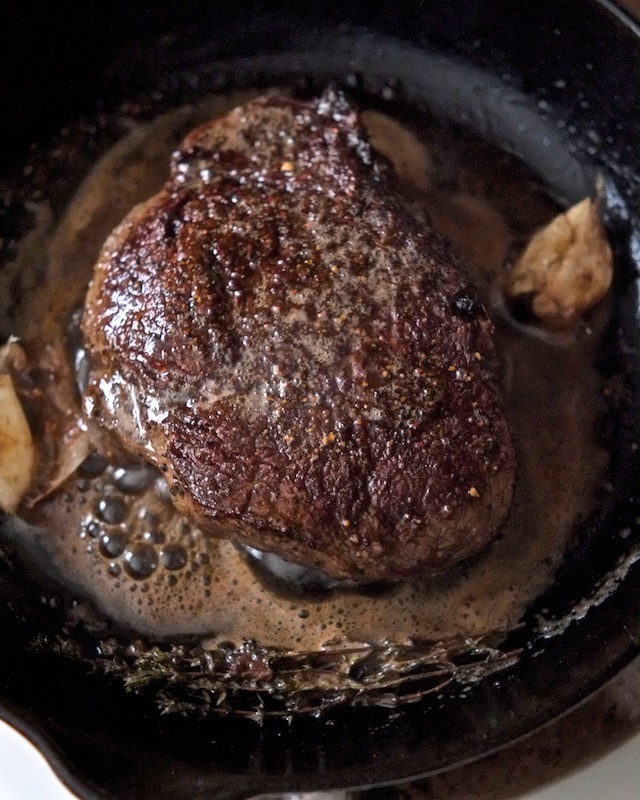 Then there’s the fact that you can baste a pan steak in butter – which is no small matter. 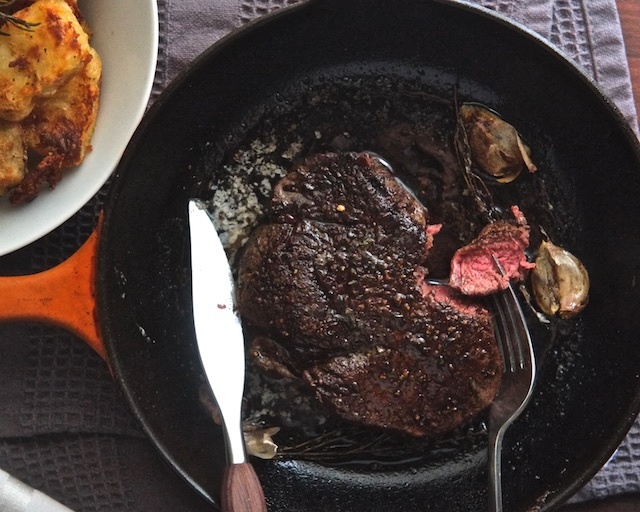 About butter-basting a steak: it’s not the same as cooking steak in butter. Steak needs high heat and butter has a low smoke point, so cooking a steak 3-5 minutes per side in butter is a mistake. 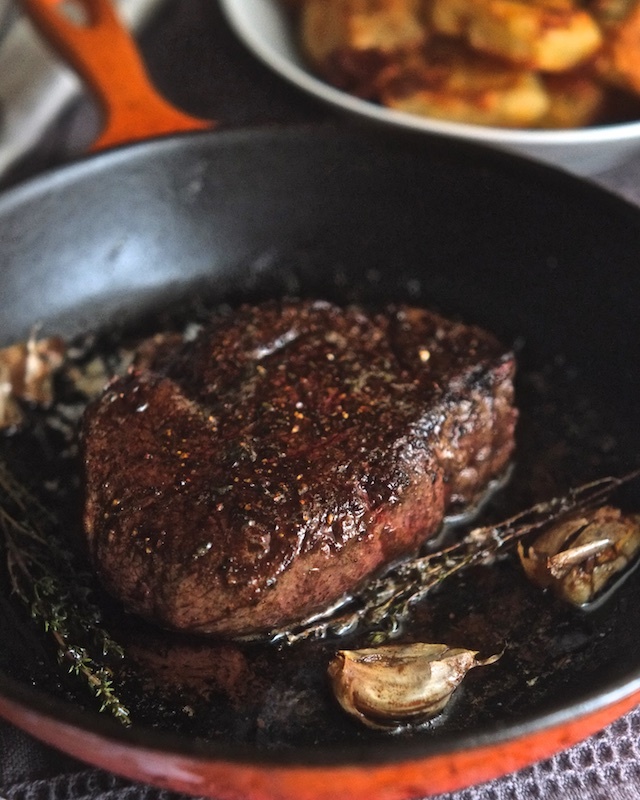 Searing an oil-coated steak in a dry cast iron pan and then nudging the heat down and adding butter at the end (with a few flavor enhancers) gives you a deeply caramelized steak, flavor infused brown (not burned) butter, and a virtually smokeless kitchen. This is the one true pan-seared steak. 1. A half hour before you plan to cook your steak, take it out of the fridge and let it rest on a plate at room temperature. Steak cooks quickly, so use this time to prepare your sides so you will be ready to serve a few minutes after your steaks come off the heat. 2. 4-5 minutes before you are ready to cook, pre-heat a cast iron pan over medium heat (if you don’t have cast iron, regular shiny metal is ok but won’t need to preheat more than 2 minutes. Avoid nonstick because it’s not made for high temperatures). Make sure your pan is large enough to accommodate the steaks you plan to cook. You’ll need about a 2 inch buffer between the steaks (if you’re cooking multiples) for a proper sear. If your pan is too small, use two or (if you must) cook the steaks one at a time. 3. About a minute before you’re ready to cook, turn your pan up to medium-high heat (high if you have an electric coil stove) . Coat your steaks in oil and season liberally with salt and pepper. 4. Put your oiled and seasoned steaks in your hot pan and don’t touch them for at least 3-5 minutes (more if your steaks are very thick). When they are properly seared, they will lift off the pan very easily. Flip them once and let them cook another 3-5 minutes. 5. 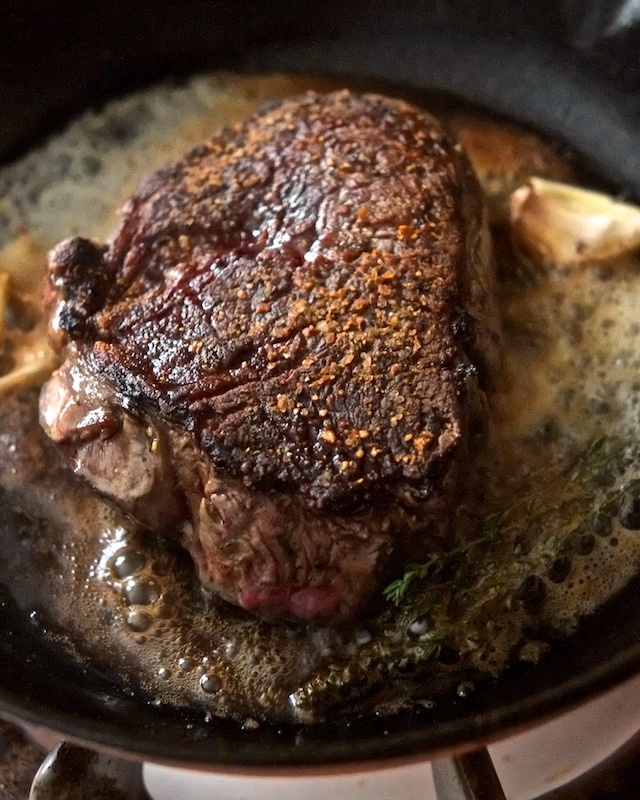 When your steaks are nearly done, turn the temperature to medium-low and drop in the butter, thyme, and garlic. Tilt the pan and scoop the melted butter over the steaks to baste. Let the steaks cook in the butter until they reach the temperature you like. This timing will vary hugely depending on the shape of your steaks and how you like them done, so if you have a thermometer, use it. If you don’t, you can make a small slit in the fattest part of the steak to check it’s doneness. 6. When the steak is cooked to your liking, remove it to a fresh plate to rest for at least 5 minutes, pretty-side up to preserve the caramelization. Use the last five minutes of rest time to set your table or finish up making a side dish. Then get ready to eat the greatest indoor steak of your life. You did that steak so well, it looks like filet mignon! Thanks Rick! It's a tenderloin steak, so almost a filet mignon, just not quite as pretty. This is now my go-to indoor steak recipe, Have made it a few times now, changing spices etc and it never fails. Thanks! Katharine! You made my day with that comment. I'm so glad it works for you. Thanks for the return and report! Using this tonight, finally a solid indoor steak recipe! can't wait to see how this turns out!! Thank you Kristen! I hope it works for you! If you need any help troubleshooting, let me know. We struggled to find a steak recipe that both the adults and kids enjoyed, but this one really makes everyone's mouth water. Even my pickiest eater LOVES this steak, and requests it whenever the word "meat" is mentioned. XD I don't see myself making steak any other way for quite a long time, if ever! Thank you Bonnie! I'm so glad you like the recipe! I think so many people default to grilling when they think steak (which is delicious), but pan-seared steak is something special in my opinion, especially with butter. I've never been able to cook steak properly - this recipe is the first time I've nailed it. So good! Thank you! So glad it worked for you! Thanks for giving the method a try! very nice riff on Momofuku Ssam Bar's large format steak. I did see David Chang's chef friend making a giant steak this way on the "Mind of a Chef" documentary series (which I LOVED), but to be fair I've seen steak done this way for ages, both on TV and in culinary textbooks. A good method is a good method though!